Results: Groves schools Eubank Jr. In a one-sided fight, WBA Super World super middleweight champion George Groves (28-3, 20 KOs) totally out-boxed a very limited challenger Chris Eubank Jr. (26-2, 20 KOs) in beating him by a one-sided 12 round unanimous decision in the semifinals of the World Boxing Super Series on Saturday night at the Manchester, England. Groves, 29, appeared to dislocate his left shoulder in round 12. That was one of only 2 rounds in which Eubank Jr. appeared to win. The scores were 117-112, 116-112 and 115-113. Boxing 247 had Groves winning by a 118-110 score. The 115-113 score was absolutely dreadful. Eubank Jr. did NOT fight well enough to win 5 rounds in this fight. Scoring it 7 rounds to 5 in Groves’ favor is too close for the contest that we saw tonight. Eubank Jr. won 2 rounds and that’s it. Eubank Jr. was woefully bad from start to finish. Eubank Jr. needs to move back down to 160, because he’s too small and limited to compete against quality super middleweights. Eubank Jr. is good against fighters like Avni Yilderim and Arthur Abraham, but he’s clearly not a world class fighter against a true talent. I think we’d have seen Eubank Jr. beaten just as badly if he’d fought Juergen Braehmer and Callum Smith. Those fighters might have even made him look worse than Groves did. The referee failed to make a call on 2 knockdowns of Eubank Jr. On both occasions, Eubank Jr. reached down and touched the canvas with his gloves. There was a knockdown in round 2 the referee missed. It looked the referee wasn’t paying attention when Groves landed a clean right hand that knocked Eubank Jr. off balance, causing him to touch the canvas. It was a punch that did it. 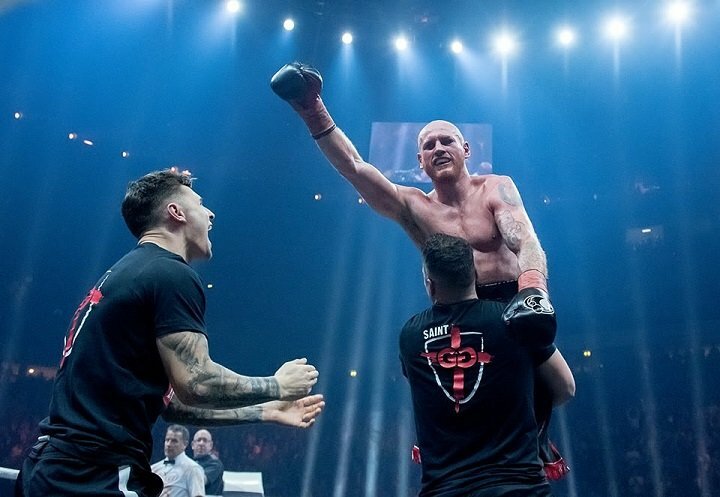 The shoulder injury Groves suffered in round 12 brings some doubt as to whether he’ll be able to be healthy enough to fight in the finals of the World Boxing Super Series. If not, then an alternate will need to be used to replace him. That’ll take a lot of the air out of the tournament, as the boxing public won’t find out the best fighter is. In round 3, Eubank Jr. suffered a deep cut on the side of his right eye from a clash of heads. The cut bled a lot throughout the fight, leaking blood all over the fighters, the referee Michael Alexander and the canvas. Both fighters were covered with the blood. Groves dominated the action in the first 8 rounds of the fight. Eubank Jr. came out looking desperate in round 9, and he was able to land some left hooks at the start. In the final minute of the rounds, Eubank Jr. landed some nice shots in close after trapping Groves against the ropes. That round appeared to be the first clear round of the fight in which you could give it to Eubank Jr. Up until then, Groves had breezed through the first 8 rounds in out-boxing the smaller, weaker Eubank Jr. from the outside using his jab and chopping right hands to the head. You are here: Home / Boxing News / Results: Groves schools Eubank Jr.